Global outsourcing is enabling business without barriers in a borderless world. As enterprises think global, their outsourcing models have changed to follow suit. Outsourcing is no longer just a short term quick-fix to achieve cost reduction. Global outsourcing uses a blend of onsite, offshore and nearshore outsourcing solutions to achieve strategic business objectives for the outsourcing company. Today, there are job titles like "Chief Globalization Officer" and "Strategic Services Manager" - which just goes to show that organizations are taking seriously the impact of global outsourcing on the revenue growth and business value of their companies. As customers get more demanding, competition gets more intense and product life-cycles shrink, there is increasing pressure on operating margins. The complexity of global cross-border business management presents new challenges as companies try harder to stay agile, profitable and innovative. Business processes need to be flexible and adaptable to enable people to respond faster to changing business needs. Services outsourcing must be aligned to business goals, rather than be seen as just a tool for enhancing operational efficiencies. Global outsourcing takes a long-term holistic view of the client enterprise and aligns its business goals to the outsourced service offerings, in contrast to tactical short-term contracts that take a piecemeal project-by-project or simple "out-tasking" approach to outsourcing. Read more about strategic outsourcing that enables companies to achieve their enterprise-wide strategic goals and focus on core competencies. Global outsourcing mitigates risks for the customer as it is not country-specific or geography-dependent and allows more freedom and flexibility in decision-making and operations during the outsourcing process. It allows businesses to learn, adapt, grow and evolve while ensuring predictability in quality and delivery in their business processes. Spurred by the introduction of sophisticated workflow automation technologies and evolving customer needs and challenges, global outsourcing takes a modular approach to service delivery. This business model was inspired by the apparel and manufacturing industries, which have realized huge benefits from outsourcing components and later, high-end design and engineering to lower-cost countries with a skilled workforce. Outsourcing service providers have streamlined business processes by breaking them into cohesive components or modules that can then be distributed across geographies, so that work gets done in the place that does it faster, better and cheaper. The global delivery model has made this possible. The outsourcing service provider takes responsibility for the entire project which is managed and executed in modular fashion in different locations, countries and time-zones, through partners, vendors or branch offices. Each supplier takes accountability and responsibility for managing the outsourced business process module assigned to him, and delivers it to meet industry-standard levels of quality. The completed modules are then assembled and presented to the client as an end-to-end business solution. Outsource2india, headquartered in Bangalore, the Silicon Valley of India, first started serving the global market in 2002. At the beginning we offered just custom software development. But soon we began offering a wide range of specialized business process outsourcing solutions designed to meet rapidly increasing market demands. Today, we are a 600 strong organization with multiple delivery centers spread across India, South East Asia and South America. Contact Outsource2india now for high-quality global outsourcing services like data entry services, engineering services, call center services, finance and accounting services, healthcare BPO, Research and Analysis services, web analytics services and more. The banking and finance & accounting services industry, the insurance industry, the IT industry, the telecom industry, the retail industry, the healthcare industry, the travel industry, the real estate industry, the engineering industry are some of the key industries that have used global outsourcing to their competitive advantage. Services successfully outsourced by these industries are: R&D, customer support, finance and accounting, product development and testing, manufacturing process support and other related business processes. Whatever their levels of outsourcing maturity, all businesses today stand to gain from the intelligent use of global outsourcing services to gain their strategic business objectives. Which business processes should stay in-house? Outsourcing experts believe that companies should keep captive the unique capabilities that differentiate them from competition and contribute significantly to revenue growth. All other activities can be outsourced. The vital element here is the control, not the ownership of business capabilities. 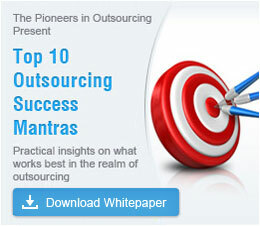 Outsourcing frees up mainline resources to concentrate on core business competencies. Read more about Outsource2india and how we work in a unique 5-stage outsourcing process that goes beyond stated objectives and helps to create value for your organization. Contact O2I now for global outsourcing services that will help your business evolve. The outsourcing decision is not location - or country - dependent. Work is done at the place that does it best and is most effective in delivering value in terms of competence, price, and resources available. The outsourcing company gains access to the specialized knowledge and technological infrastructure of service providers in different parts of the world. Nearshore solutions offer the advantages of cultural compatibility, linguistic ability and similar timezones. Offshore solutions from countries located in different timezones offer access to specific skills, better quality and the 24x7 advantage for faster time-to-market. Onshore solutions offer the benefit of efficient knowledge transfer and understanding of client requirements and processes, while laying the groundwork to transition the process offshore. Global outsourcing leverages a blend of these solutions to offer the client best-of-breed services at the best price, and follow-the-sun flexibility. In case disaster hits one region, work can be quickly transferred to disaster recovery centers, thus mitigating risk, offering service redundancy and allowing business to carry on smoothly. Global outsourcing allows consolidation of services and operational efficiencies across borders, eg a single global delivery center can take care of the order management system for an entire global enterprise where there would have earlier been 30 centers or more. More freedom and flexibility in decision-making and operations during the outsourcing process. Businesses are not locked into outdated or static processes but can change and evolve to meet new business challenges, while benefiting from the predictability and quality of service levels. Strategic business objectives are met by gain-sharing arrangements defined by SLAs, where an outsourcing service provider's income is related to key metrics of a client's business success. This way, both the outsourcer and the service provider stand to gain from achieving the stated objectives. Transformational outsourcing results in big leaps and innovation by optimizing and simplifying complex business processes to offer value-added benefits. The Benefits of Outsourcing – why you should consider it and how it can help you. An overview of IP considerations related to outsourcing.